The heavy duty Willis Mammoth SK & SE series conventional lathes are extremely robust, well-built, and dependable lathes. The SK & SE lathes have precision ground spindles supported at three points by high precision bearings. These hollow spindle lathes incorporate a straight forward, low maintenance design. Willis Mammoth SK & SE series geared head engine lathes feature large, widely spaced bed ways and a large diameter lead screw for maximum rigidity and minimum vibration. These lathes have a standard 4⅛” hollow spindle bore, and offer an optional 6” hollow spindle bore for the SE series. In addition, an optional rear chuck adaptor, specifically designed for large diameter pipes and shafts requiring maximum holding power, for applications like oil field work, ship building, conveyor manufacturing, roller manufacturing, and hydraulic cylinder manufacturing is available on Willis geared head precision lathes. SK conventional lathes offer a 4” Spindle bore with A-2-8 mounts. SE conventional lathe models offer a 6” spindle bore with A-11 mounts. All geared head lathes offer a gap bed and a totally enclosed universal gear box. These engine lathes as well as our Willis Colchester style lathes, provide inch, metric, modular, and diametric pitch threads. An inch thread dial is also provided. Automatic longitudinal bed stops are also included with these metalworking lathes SK and SE model lathes come equipped with a 2-speed tailstock quill. 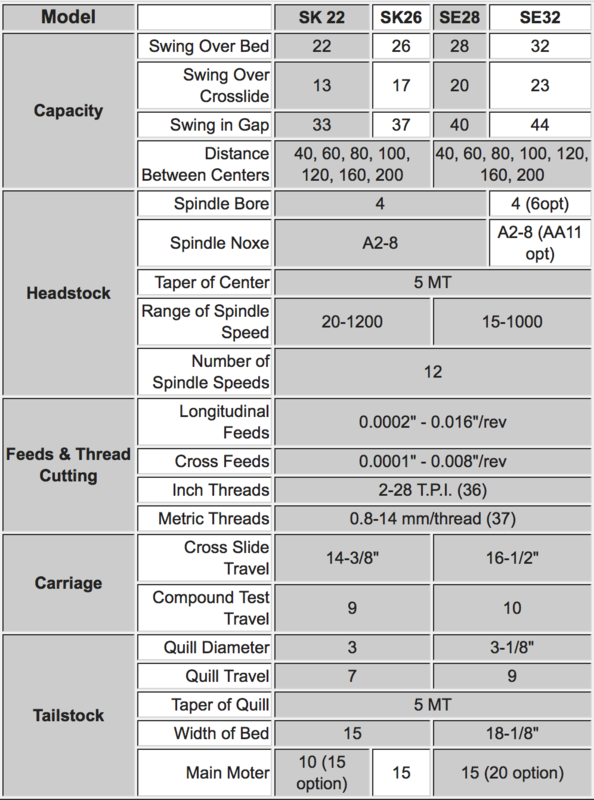 Inch/metric dials and graduations allow for accurate and precise machining. For optimal safety, a manual foot brake and an adjustable feed overload & safety clutch on the apron and carriage are standard on Willis geared head engine lathes SK & SE engine lathes provide hardened and ground gears as well as induction hardened and ground bed-ways. Willis conventional lathes have manual/automatic lubrication systems for the lathe’s slides. A flood coolant system enables our conventional lathes to maintain extended tool life. A rotary dial system on SK & SE conventional lathes for quick and easy spindle speed changes is also provided. A four-way tool post for quick tool changes is standard on Willis conventional lathes A 12” steady rest, center sleeve & 5mt dead centers are included with the SK & SE lathes. Our conventional engine lathes are provided with a tool box, tools and tool-post wrench. These engine lathes provide a halogen worklight for a brighter workspace. 3-Jaw chucks, 4-Jaw chucks and collet chucks available for these conventional lathes. 6” A2-11 rear chuck adaptor for double chuck with guard.